The Spazmatics with the Captain Hiram's staff in Sebastian, Florida. 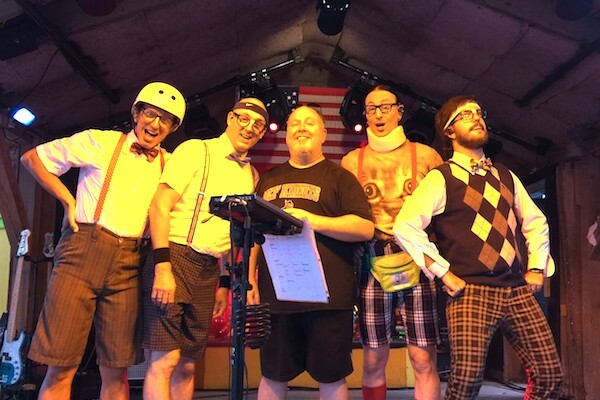 SEBASTIAN – The Spazmatics provided an evening of pure energy and entertainment recently at the Captain Hiram’s Sandbar, and we were lucky enough to score an interview with them. “It started in Los Angeles and was franchised next in Las Vegas where I was the singer. Then moved to Orlando, two years ago, and started it here,” Kurt Frohlich, The Spazmatics lead singer, told Sebastian Daily. 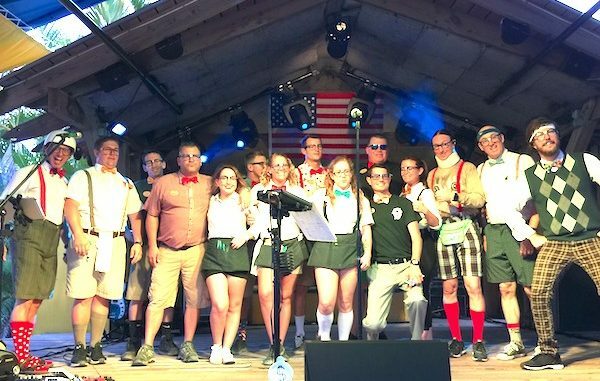 At Captain Hiram’s, the staff was decked out in nerd outfits complete with skinny ties, bow ties, and horn-rimmed glasses. 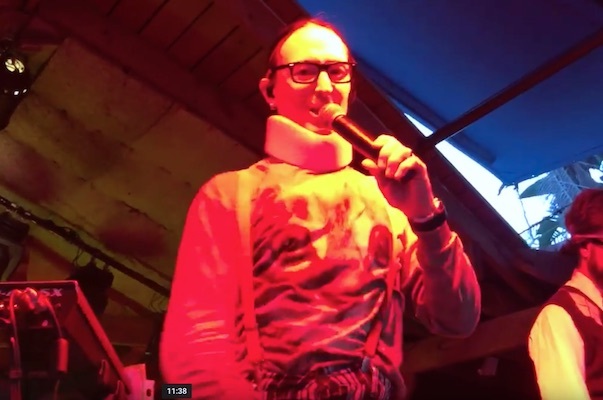 The Spazmatics are one of the best bands that play at the Sandbar, and it appears that people in Sebastian didn’t waste a chance to see them perform. Andy Hodges of Sebastian Daily (center) interviews The Spazmatics. This was my third time seeing their performance, and there’s never a dull moment. “We mostly perform for corporate companies. We are playing in New Orleans, Washington DC and Barcelona, Spain in October alone. We are looking for the right venue to play on a regular basis in Orlando. What places have to realize is that we are a show, not just a cover band,” Frohlich said. The band will break out into comedy routines from time to time, all while the music is still playing. 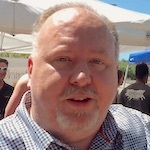 “We write all our bits, and a lot of the jokes are improv,” Frohlich said when asked about the comedy skits. All the songs chosen are high-energy dance, from the 1980s and 1990s, but they also go with current songs as well: “Rock the Casbah” by the Clash, “Don’t Stop Believing” by Journey, and songs by Men at Work. They play songs that are going to energize the audience. Aside from The Spazmatics, Frohlich plays a solo, duo, and a trio called Acoustic Edge that play at Disney Springs on a regular basis. “We also have a British rock band called The Hooligans, and a 90’s Band called Anti Idol. All of these are cover bands. In addition, we all have our original bands: The Underground Rebels and Megaphone. You can get The Underground Rebels music on iTunes,” Frohlich added. You can learn more about the band by visiting their Spazmatics Orlando Facebook page. Speaking of our town, what do The Spazmatics think of Sebastian? “We love it. Friendly, laid-back people,” Frohlich said. 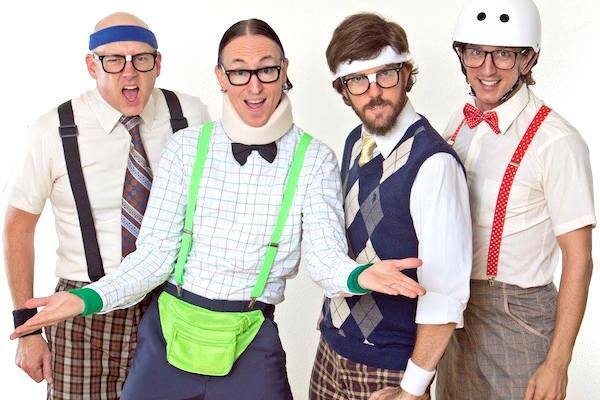 The Spazmatics is a must-see, so make sure you see them next time they’re in town.